The Snow Leopard Conservancy engages local communities using a highly participatory planning process known as Appreciative Participatory Planning and Action, or APPA. APPA significantly extends the more traditional rural development tools such as Participatory Rural Appraisal. 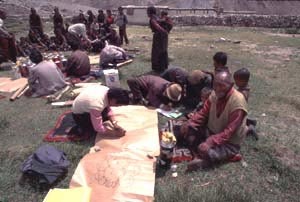 The Mountain Institute (TMI) has developed and pioneered APPA as a community-action and learning tool. It combines concepts from Appreciative Inquiry (used in business leadership training) and Participatory Learning and Motivation, in a collective inquiry and planning process that fosters effective group action. In our context, APPA enables participants to better explore ways in which biodiversity protection, livestock (or crop) damage alleviation and income-generating opportunities can be implicitly linked to the benefit of local residents and the protected area’s overall objectives. delivery – spurring participants to initiate community-improvement actions immediately rather than waiting for some future time or depending on a government subsidy that somehow is always delayed for lack of funding. APPA has been applied to community-based conservation initiatives in Nepal’s Makalu-Barun Conservation Area, in Sikkim’s Khangchendzonga National Park, in Tibet’s Qomolangma Nature Preserve and India’s Hemis National Park. It has empowered communities to learn from their successes instead of focusing on their problems, mobilized individuals and groups toward concrete actions which they can start immediately, and initiated long-term change toward self-reliance. APPA is relatively quick and easy for villagers to learn and implement by themselves. Junior park field staff found it relatively easy to understand and implement with minimal training. Linkage with Biodiversity Conservation We invest in a community with the primary objective of conserving snow leopards and other mountain biodiversity. This linkage is constantly reinforced during village mobilization and planning meetings, so that it becomes associated with the project activities we support. Reciprocal Contribution All stakeholders (villager, NGO, or government) must make a reciprocal contribution, within their means, to compliment that being made by the Conservancy. This may be in the form of in-kind services such as materials and labor, which are valued using existing market rates. Participation Strong commitment to active and equitable participation is expected from each involved stakeholder through the life of the project, from planning to implementation, monitoring, evaluation and reporting. The project activities should benefit as many individuals and households as possible, and be sensitive to matters of ethnic or economic equity and gender. Responsibility The beneficiary community must be willing to assume all or significant responsibility for repairing and maintaining any infrastructural improvements we provide. Monitoring & Evaluation The stakeholders must be willing to employ simple but realistic indicators for measuring project performance and impact, according to a Monitoring and Evaluation Plan (part of the overall Action Plan).